Size of Male: 7-9 lbs., 9-11.5 in. Size of Female: 7-9 lbs., 9-11.5 in. The Affenpinscher is described as a peppy little dog with the face and the playful nature of a monkey. They are wire-haired and very much like terriers in some ways. They seem to think of themselves as big dogs and have a proud strut when they walk. “Affens” were originally bred to hunt and kill vermin around stables but they later took on the role of being companion dogs. They are fun-loving and make great family pets. The exact origin of the Affenpinscher is unknown but it’s believed they are one of the older Toy breeds. They come from central Europe and were developed in Germany and France. By the 17th century, dogs of this type were being used around stables and on farms to hunt and kill rats and other pests. They were gradually bred down in size and became popular as small companion dogs. In German the word Affenpinscher means “monkey dog,” referring to the dog’s monkey-like face. Affens were probably used to develop other rough-coated breeds such as the Brussels Griffon and the Miniature Schnauzer. 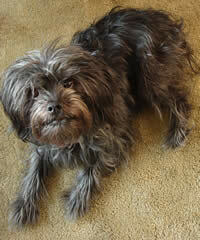 The Affenpinscher is very loyal and affectionate toward its family and friends. They are usually quiet in the home but they can become very excited if they feel threatened in some way. These little dogs are said to be fearless when necessary, probably owing to their terrier ancestry. Otherwise, Affens are very playful and fun-loving. This dog breed can be quite mischievous and they are very active indoors. However, they do make ideal apartment dogs because of their size, as long as they get some exercise each day. They like children and do well as a family dog as long as children are taught not to be too rough with them. Affens may also tend to guard things, so children should be taught not to try to take things away from them. You should supervise small children around these dogs. They are intelligent dogs and usually take well to dog training since they do have a desire to please their owners. Affens usually get along well with other pets. They can be difficult to house train. Living Environment – The Affen makes an excellent apartment dog due to his size. He is often very active indoors but with his small size this shouldn’t be a problem. He can get into things, so make sure he gets some exercise each day. He also makes a good house dog if you don’t live in an apartment. Grooming – Grooming for this small dog breed is not difficult. They have a wiry coat that needs to be brushed and combed about twice a week. They should be trimmed a couple of times per year. Bathing should be as necessary but they don’t require frequent baths. Diet & Exercise – Dietary needs are considered normal. They do need to have a good walk every day and they can enjoy a small fenced yard. Health – Affens can be prone to urological problems, fractures, slipped stifles, patent ductus arteriosus, open fontanels and to having respiratory problems when the weather is hot. Canine hip dysplasia can also be a problem, as well as collapsed tracheas and cataracts. Of course, some of these issues may only occur very rarely. If you are interested in this dog breed, you should talk to a breeder about possible dog health problems. Affenpinschers are intelligent dogs but they can be stubborn at times. They can also become easily bored if dog training is not interesting. Do your best to make training fun and you should be able to train your Affen. You do need to stay in charge at all times with these dogs since they can take over if you let them. Use positive dog training techniques (praise, rewards) and these dogs should learn quickly.